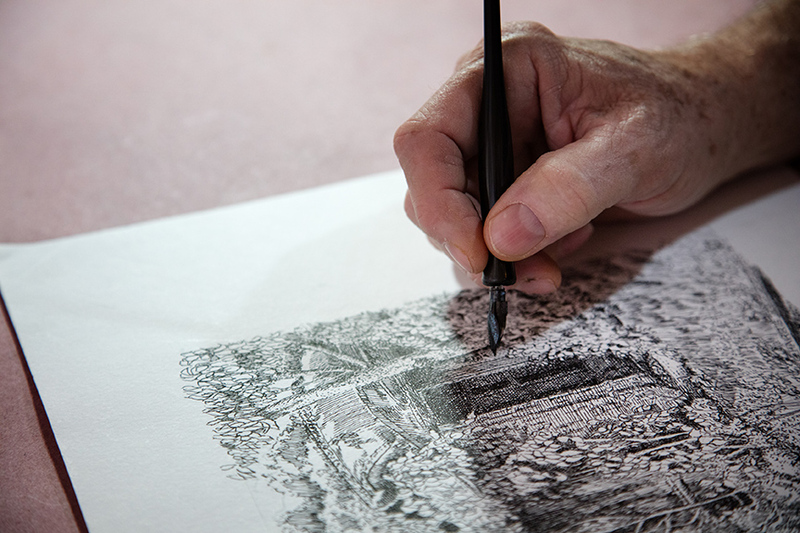 Pen-and-ink artist Carl Harris draws you into his artwork with a few simple lines. Carl Harris moves you with a few strokes of his pen. 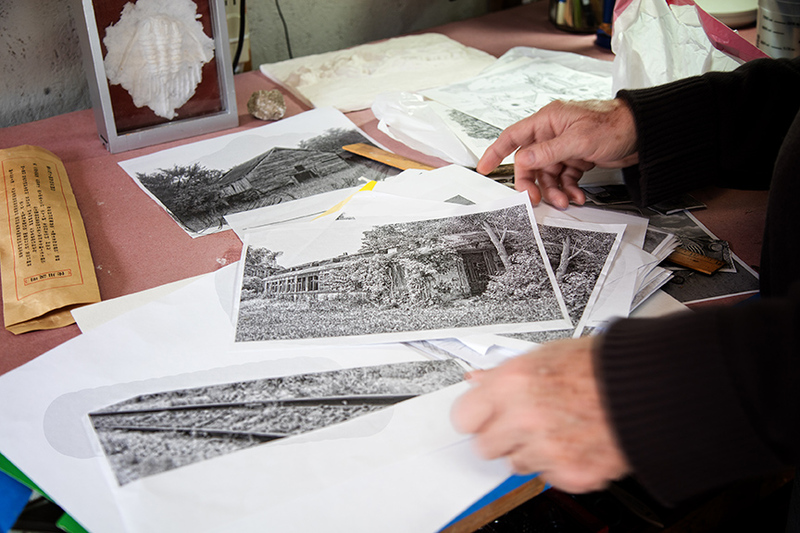 Up-down, left-right, the layered lines in his ink drawings create tones that pull you right into the picture. It’s an unexpected sensation, particularly since his current subjects – massive stone churches, turn-of-the-century row houses, the Arch – don’t budge. But when you peer into a darkened window, or drift along with the clouds, you realize that you’re not just observing Harris’s work, you’re participating in it. 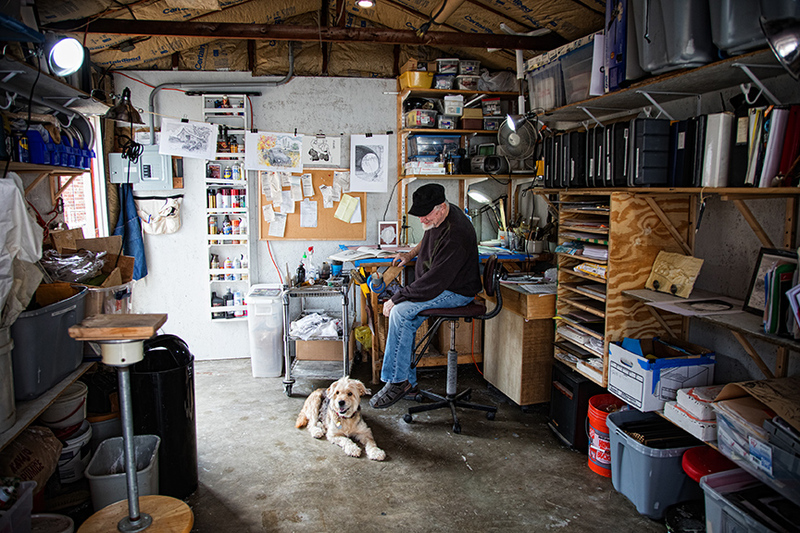 Harris, age 71, started sketching at the age of 10, using art supplies handed down by his Air Force-bound older brother. Harris’s 8th grade homeroom teacher encouraged him to attend art school; instead, Harris followed in his brother’s military footsteps and joined the Navy Reserve. He met and married his wife and started a family and a career in advertising sales, but he was never without his sketchbook. “Everywhere I go, I people watch. I’ll draw someone in 30 or 40 seconds, and if it’s good I’ll give it to them. When I go to Vegas, I’ll get up early just to [sketch] people walking home. That’s a lot of fun,” Harris says. 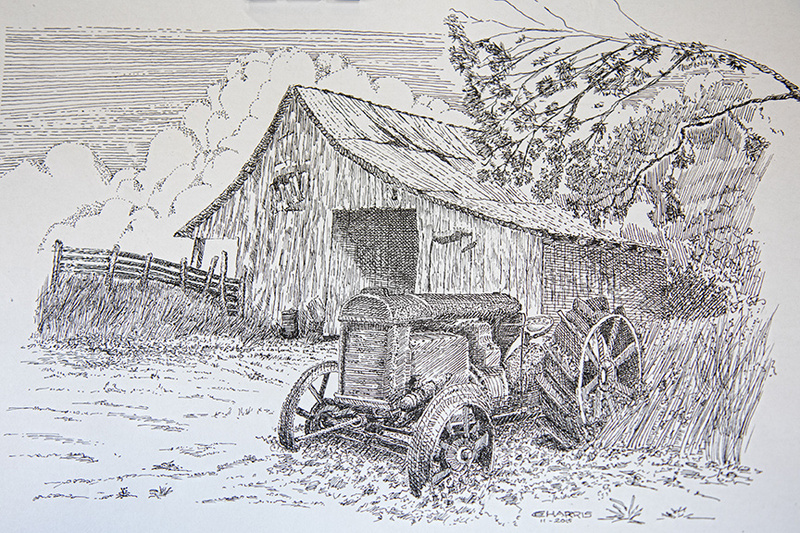 While Harris has captured many subjects in a variety of mediums over the years, one of his current passions is to draw buildings in pen and ink, using different pen nibs to make crisp, distinctive lines. 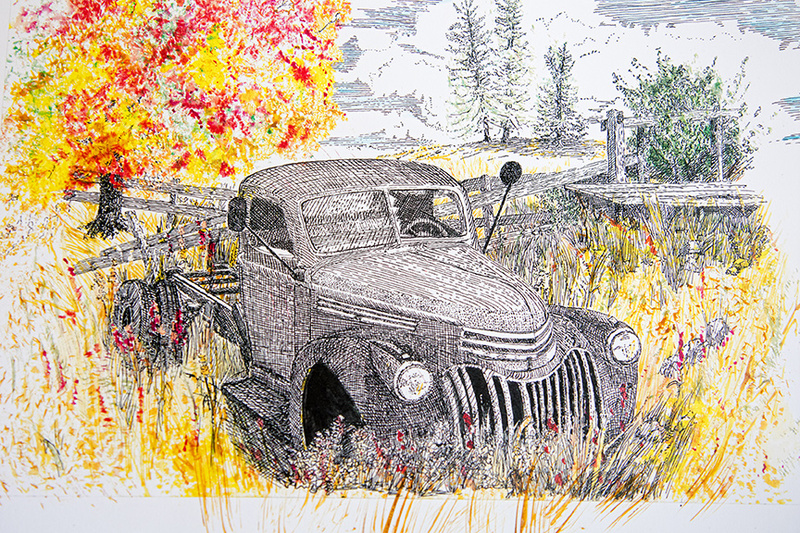 He angles the lines using an etching technique called cross-hatching, adding more lines to create texture and tones. “I want the line to be seen. I don’t want something to be [solid] black. I want the lines to build up to black. I could use paint, but then I wouldn’t have the movement,” explains Harris. What’s next? That’s hard for Harris to say, since “everything interests me.” But the gates in the Central West End and University City are calling to him. “It’s really fascinating. They were built at the turn of the century, to create privacy, but also to say, ‘watch where you’re going’. Gateways are demarcations of moving from one area to the next, and one class to the next.” He noted that, as a society, we still make distinctions between classes and cultures. Which very well may be why his drawings of ancient history feel so relevant today. 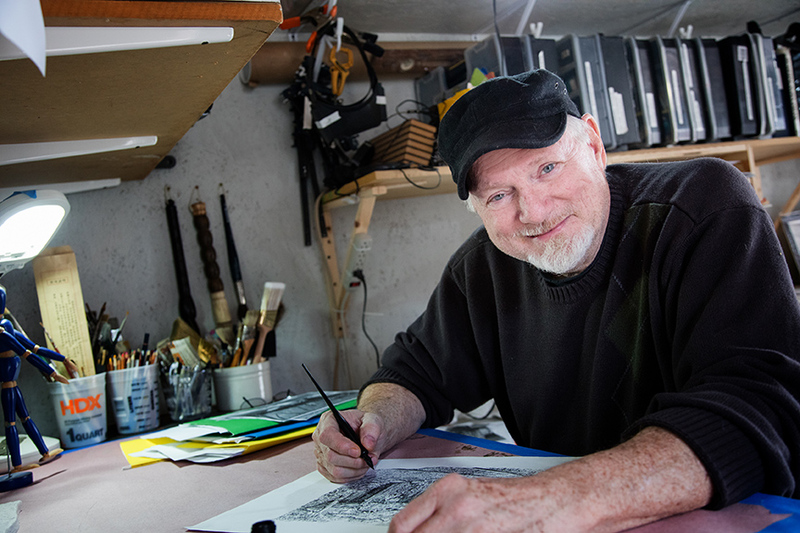 Harris sells prints of his drawings on his website, and he is also available for custom projects.